Note:Starting in 2012, all 6T30/40/45/50 models have 3-pinion reaction carriers. The 3-pinionreaction carriers are back serviceable for all models. Original Configuration:The 6T30 and 6T40 had 3-pinions.The 6T45 and 6T50 had 4-pinions. 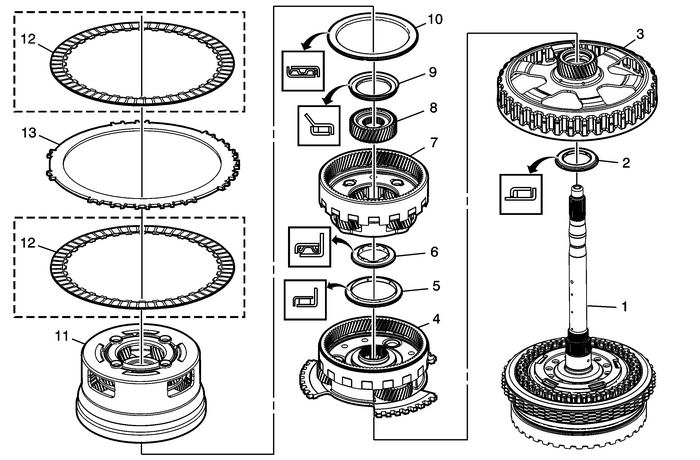 The 6T30 and 6T40 have 4-pinions.The 6T45 and 6T50 have 5-pinions. Begin with the clutch plate assembly and alternate with the clutch plate.The number of grooves in the clutch plate friction material varies depending on model. Note:Only install one 2–6-Clutch Plate at this time. The remaining clutch plate is installedinto the case.